psion organiser ii 16k. Datapak Model cm. Condition is Used. Dispatched with Royal Mail 2nd Class. ASUS My Pal Pocket PC working ok, no charger! It is working ok. For condition, check pictures. This will work as intended. Non ho il caricatore.non testato.in buone condizioni. PalmOne Tungsten T3 Handheld - working, with Docking Station Plus Other Software. Condition is Used. Dispatched with Royal Mail 1st Class. 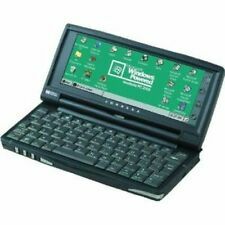 Handspring Visor with case and stand. Condition is Used. Dispatched with Royal Mail 2nd Class. Device appears to be working. Used and in good condition. Palm M505. Condition is New. Shipped with USPS Priority Mail. ROLODEX ELECTRONICS. COMPATIBLE PC 512 KB. ENVOI RAPIDE ET SOIGNE. SEE THE PHOTOS FOR DETAILS AND STATE. Vintage Compaq C140 Microsoft WinCE PDA Handheld Keyboard with Targus Carry Case. Comes in condition shown, has a few minor scuffs and scratches. Tested working powers on. Runs on 2x AA batteries. Carry case is a bit dirty and worn. Please feel free to ask anything or for more pics. Thanks for looking! Up for sale is a new but other ViewSonic V37 Pocket PC New Other No original box. The adapter cord for the computer has discoloration on it, but it should work with no problem. I ran ScoutDB test app on this device and it succeeded. IBM Workpad 3.0 8602-20X PDA (Personal Digital Assistant). with Original IBM Workpad Padded Case. It takes 2 AAA batteries. There is no stylus included. It has the classic black and white screen. I will respond to all inquiries with a prompt and specific answer. Very good condition and functioning as they should. 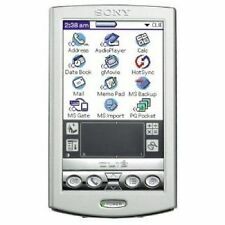 Spec: 16MB Ram, Backlit Touch Sensitive Screen, Infrared Communications Port, 36MHz CPU. Compliant with Microsoft, Lotus, WordPerfect and Corel Suites. H as a few scratches to the outside of the case but inside it is in an excellent full working condition. 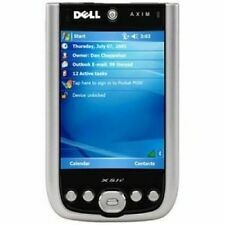 I am selling the Dell Axim Pocket PC. This Pocket PC measures approximately 3" wide and 5" tall. Cosmetically, the Pocket PC is in near-perfect condition. I do not have the cord to charge it, so it has not been tested. It can be returned if it does not work. It comes with the 128MB SD and the Rhino-Skin cover. The cover has quite a few scuffs and scratches. Powered by SixBit's eCommerce Solution. 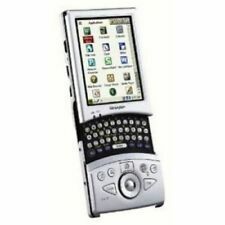 Sharp Zaurus CG Silicon Handheld 480x640 Display 64Mb RAM (SL-6000L) NO CHARGER. Comes in condition shown, has a few minor scuffs and scratches, tested working but backup battery may br bad. has lanyard and stylus pen. UNIT ONLY - NO CHARGER OR ACCESSORIES INCLUDED. Made in Japan Please feel free to ask anything or for more pics. Thanks for looking! Tested and working Franklin LM6000 Speaking Language Master LM-6000. It comes with Manual. Condition is Used. But overall in very nice shape. Screen and button are all clear and work as expected. Please see photos of the actual item you will receive. Or if you buy a part and it doesn't fit your needs. APPLICATION FOR A PART NUMBER IS YOUR RESPONSIBILITY. We describe them to the best of our ability. Understand these conditions before you buy. I've got tons of parts right now IT'S just going to take awhile to get them all listed cuz I'm a one-man band. This is aDell Axim X50 PDA Personal Digital Assistant. Standard Built-In Bluetooth 1.2 Compliance. Built-In Secure Digital expansion slot. Alphabetical Tabs to highlight as you search, scroll button for easy searching. Includes batteries, but since it is from 2003 they may need to be replaced. 3" x 4.25". Psion II Pocket Spreadsheet software on a 32k datapack (4 line version). This is the 4 line (LZ/LZ64) version, although it will work on the XP (but obviously only displaying 2 lines). Psion II MATHS software on a 32k datapack. Psion II FAST 5 COPIER software on a 32k datapack. 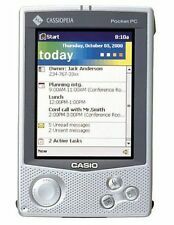 Spec: 16MB Ram, Backlit Touch Sensitive Screen, Infrared Communications Port, 36MHz CPU. Compliant with Microsoft, Lotus, WordPerfect and Corel Suites. All in full working order. FREE CASE with buy now price (£69.95). HP IPAQ PDA used in good condition. User's Guide. Marks from previous owner. MY PHOTOS ARE THE ACTUAL PRODUCT. Here's a SEGA IR7000. Case is clean and free from imperfections. Psion II Games software on a 32k datapack.